Getting stronger before surgery has been shown to help cancer patients do better long term. So-called "prehabilitation" to prepare someone for an upcoming stressful event has been used quite a bit in orthopedic surgery, Dr. Julie Silver, a physiatrist at Spaulding Rehabilitation Hospital in Boston, tells Shots. And there's increasing interest in using it before cancer treatment, especially to help frail or elderly patients better tolerate what lies ahead, she says. Researchers from McGill University in Montreal studied 77 patients scheduled for colorectal cancer surgery. 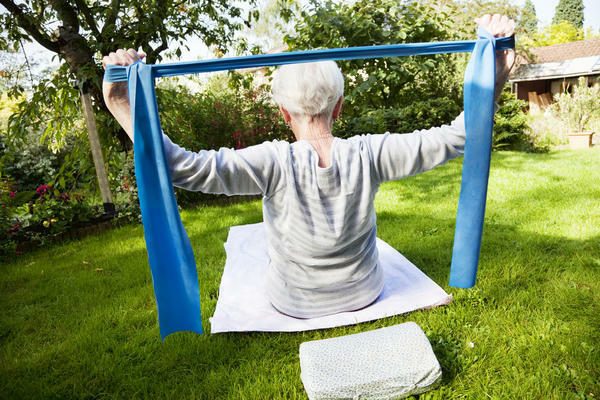 A kinesiologist gave the patients aerobic exercises and strength training to do at home. A registered dietitian gave them nutritional counseling and prescribed a whey supplement to make up any protein deficits, and a psychologist provided anxiety-reducing relaxation exercises. Half of the patients were told to start the program before surgery – an average of about 25 days before – and to continue afterward for eight weeks. The other group was told to start right after surgery. Not surprisingly, the group assigned to prehabilitation did better on a presurgery test that measured how far they could walk in 6 minutes. And it paid off. Two months after surgery, the prehabilitation group walked an average of 23.7 meters farther than when they started the study. Rehab-only patients walked an average of 21.8 meters less than when they started. (A change of 20 meters is considered clinically significant.) And a greater proportion of the prehabilitation group was back to baseline exercise capacity by then. The study appears in the journal Anesthesiology. It's not clear which elements of the program caused the improvements, Dr. Liane Feldman, a surgeon at McGill and an author of the study, tells Shots. "There have been questions whether exercise alone was enough," she says. A previous study by the group used exercise only, and the patients assigned to a structured aerobic exercise and strength-training program did worse than the group assigned to a simple walking and breathing routine. So the nutrition and stress-reduction elements used in this study might have helped, too. Both groups recovered fairly well, likely thanks to the widespread use of minimally-invasive surgery and other measures taken in the hospital, and there were no differences in complication rates, says Feldman. She says this study is proof that the concept of prehabilitation can work. A larger study targeting people at higher risk of complications, such as those whose function is deteriorating before surgery, is a next logical step. Silver, who developed a model of cancer prehabilitation, says other components can include specific exercises aimed at the area being operated on, such as movements increasing the range of shoulder motion for breast-cancer patients. And while prehabilitation looks promising, nobody should delay cancer surgery or treatment in an effort to squeeze it in. "Use whatever window of time is available," Silver says.